This is fine if you are ready to host your games on the web, but what if you just want to develop or experiment with phaser on your local machine and dont want the hassle of installing and configuring a web server. Here is an extremely useful and quick work around! 1. Download Google Chrome for free from google.com. 2. During installation allow it to create a shortcut icon on your desktop. 3. 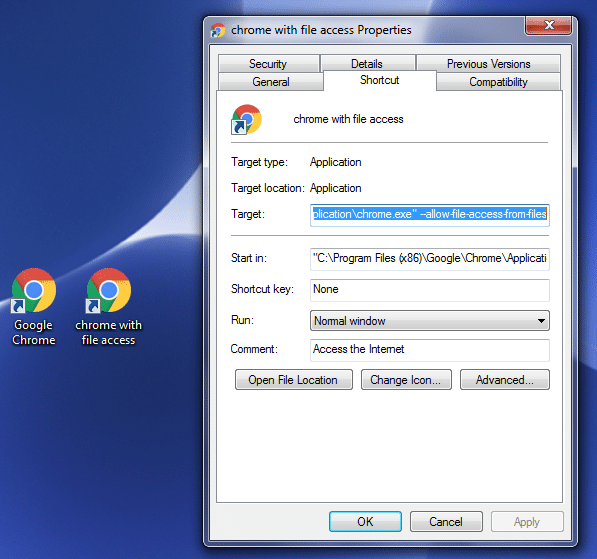 Make a new copy of the shortcut and rename it, (for example: 'chrome with file access'). 4. Next right click your newly created icon and select 'properties'. 5. Find the 'target' box and add --allow-file-access-from-files to the end of it. It should now look similar to this "C:Program Files (x86)GoogleChromeApplicationchrome.exe" --allow-file-access-from-files. Thats all! You can now use the full power of phaser from files saved anywhere on your computer. Don't forget to send us a link to any exciting new projects your creating!